Discover the hidden, booze-filled underbelly of New York City with the Prohibition Pub Crawl East Village. On this three-hour walking tour, you'll visit pubs that once served as speakeasies during Prohibition along with other hidden bars. Your tour guide will help make the past come alive. The 18th Amendment to the U.S. Constitution later known as the Volstead Act catapulted the criminal world in New York. See where some of the famous gangster murders and kidnappings in the neighborhood took place. Learn about the female-led Temperance movement in their drive to rid American life of alcohol. 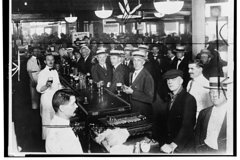 Learn the role commerce played with the many immigrant beer barons and bootleggers who opposed the moral crusades of the day and became immeasurably wealthy because of it. And, of course, we'll have a good time sipping vintage craft cocktails made by top bartenders. It will be the Bee's Knees! Start time is at 6 PM on Wednesdays, Fridays and Sundays. We will visit three or four pubs in three hours time. The choice of pubs will be based on accessibility yet with the early start time there should be no problem maintaining the suggested itinerary. We will meet at Scheib's Place, a speakeasy located at 80 St. Marks Place in the East Village (close to First Avenue) and stay in the East Village neighborhood for the duration of the tour. We will walk approximately 1.5 miles on the tour between the pubs. The tour will include one complimentary beverage not to exceed $10. Tour goers will be responsible in paying for subsequent drinks. Between the pubs, you will see the sights and you will learn some of the history related to those sights. Tour content will include some true crime history on the streets and the history of Prohibition will largely be dispensed inside the pubs. Included in this narration will be the history of alcohol use in the United States. This includes what types of beverages were drank, how much and the places it was consumed. We will look at immigration patterns to the U.S. from Europe and how it influenced society and changed drinking habits. We will spend approximately 35 to 40 minutes inside each pub. You will have the opportunity to drink cocktails from another era and learn about mixology. Further, most pubs we visit will have food menus as well including the original location. Tour will run rain or shine. The pub crawl will end at approximately East 10th Street and Avenue B in the East Village, very close to more restaurants and public transportation. Two of the pubs we visit were actual speakeasies during Prohibition. And the other two pubs are hidden or what we like to call speakeasy-inspired pubs. This will give the illusion as if you are entering a forbidden location during Prohibition. One place takes cash only so please have some cash on hand. The other places take all major credit cards.